Protect your electronics investment without breaking your budget. This surge suppressor guards against damaging spikes and surges, providing a secure barrier for your sensitive electrical equipment and precious data. The negative effects of Electromagnetic and Radio Frequency Interference (EMI/RFI) are also kept in check by a built-in noise filter. Wall-mountable, impact-resistant ABS plastics keep the unit looking good for years to come. 14 AWG suppressor power cord is 4 feet long. For indoor use only. 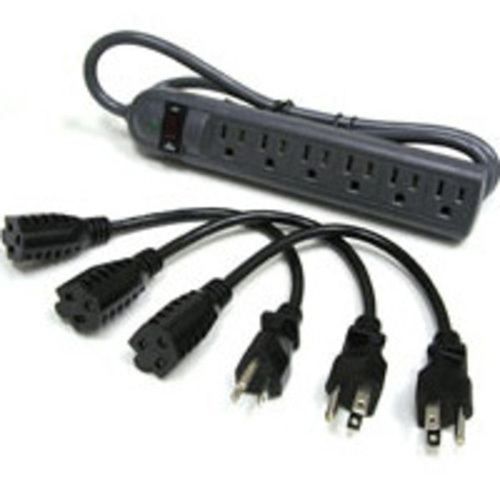 Plus, three outlet saver extension cords are included to keep your surge suppressor and UPS outlets from being blocked by bulky AC transformers!